Tony Oursler in his New York apartment, holding an antique stereoscope viewer from the mid-1800’s. Tony Oursler’s multimedia works often take the form of a video of a talking head or a blinking eye projected atop an inanimate object—a fabric dummy, a monochrome painting, or even a tree. 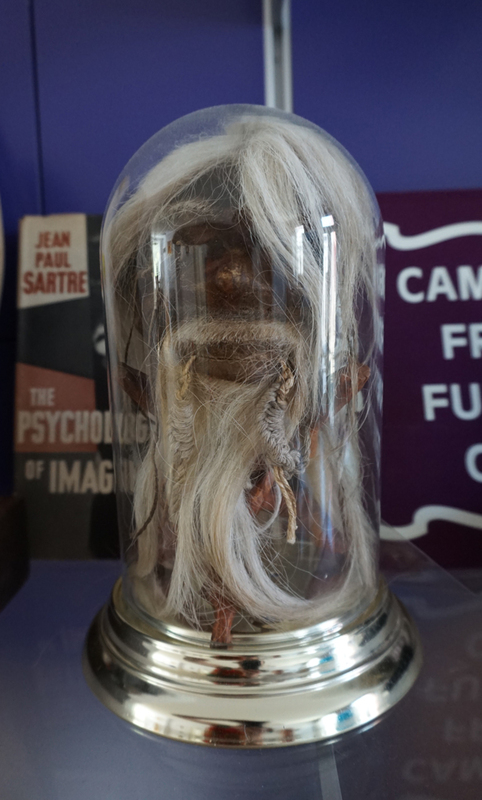 These somewhat spooky pieces have their roots, in part, in Oursler’s extensive collection of magic and spiritualist paraphernalia. A selection of his holdings is included in “Tony Oursler: The Imponderable Archive,” an exhibition curated by Tom Eccles and Beatrix Ruf that is currently on view at the CCS Bard Hessel Museum in Annandale-on-Hudson, New York, though his apartment in Manhattan is still well stocked with Ouija boards, Italian spell books, and other mementos of the fringe practices that fascinate him. When I visited Oursler at his home, he was gearing up for the opening of “Tony Oursler: Imponderable” at the Museum of Modern Art, which features more ephemera and an immersive film. In the workspace below the artist’s apartment, an assistant was putting the final touches on that feature-length film, also titled Imponderable, which was produced using a contemporary form of Pepper’s ghost—a 19th-century phantasmagoric device. A look through Oursler’s spiritualist paraphernalia follows below. A vintage ESP-1 Extra Sensory Perception Tester, which was a gift from one of Oursler’s former assistants. 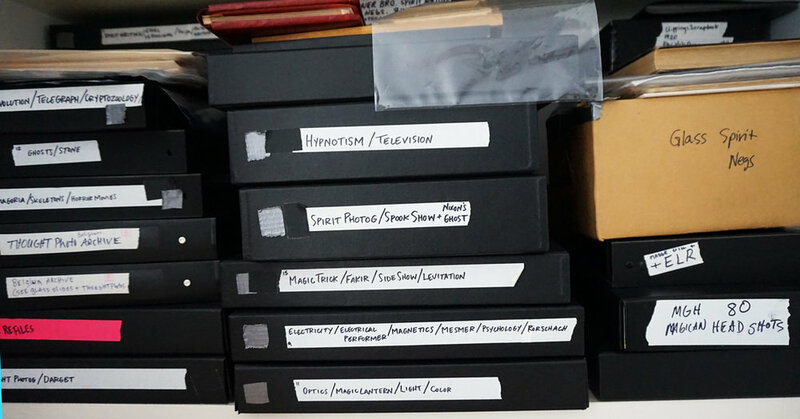 Some of the archived material Oursler keeps in his apartment. Just one in a series of Italian spell books. “This guy is crazy,” Oursler said of this modified mask. A mask that Oursler called a “Crampus-Type mask,” referring to the anthropomorphic Austrian figure who punishes children during the Christmas season, in sharp contrast to St. Nicholas. Oursler scours thrift shops and antique stores and “binges online” from time to time. One of Oursler’s Ouija boards. Collecting Ouija boards, he said, “is a pretty highly competitive thing,” but he has a few. A crown that Oursler found online.